We offer a rat eradication service for your home and business. A rat infestation inside or outside the home or business can not only be upsetting but pose the risk of rats causing damage, introducing disease and ruining a businesses’ reputation. We are the experts in rat control so will ensure a safe and effective eradication of that troublesome infestation. 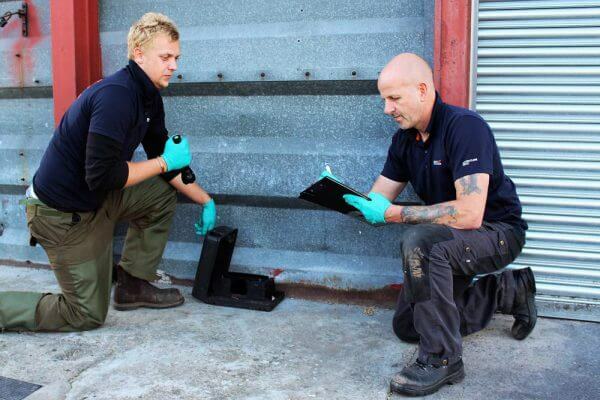 If you are unsure as to whether you have a rat infestation, then arrange a rodent inspection with us. Our qualified rodent expert will conduct a thorough property survey. If an infestation is confirmed, a treatment will be implemented that will identify any proofing issues that have allowed the rats to gain access to the property, as well as making recommendations to prevent future issues. 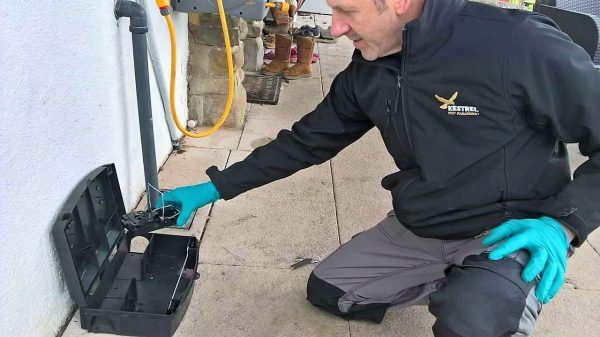 We will carry out a full survey of your property to determine the extent of infestation, levels of infestation and how the rats have gained access to your property. As rats will readily live outside and in the drainage system, we will also survey these areas. We ill devise a rat treatment programme using rodenticides and traps that will safely and effectively eradicate the rat infestation. We will revisit at regular intervals to replenish baits and empty traps and evaluate the treatment programme. We will offer free advice on how to prevent future rat infestations. This highlights the need for good hygiene practices when a rat infestation is present. 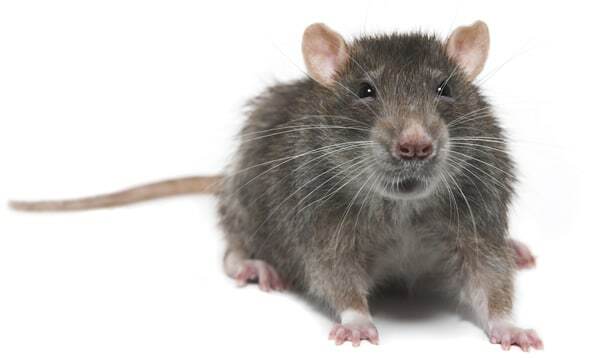 Rat Contamination: Once rats gain access to our homes and businesses, they will contaminate our food and food preparation areas with urine, droppings and hairs. Rats will readily chew their way through food packaging and whole stores of food may have to be thrown out due to spoilage. When rats gain access to the loft, they will contaminate the loft insulation and stored items with droppings and urine that, with an intense infestation, will cause a lasting smell. Sometimes this can only be rectified by the removal of the loft insulation. An external rat infestation will contaminate areas surrounding homes and business. Children’s play areas, kennels, garden furniture are all prone to contamination. Rat Damage: The chewing damage caused by rats can be considerable and can have serious financial implications. They will chew wood, plastic, soft metals, plaster and upholstered furniture. Sometimes they will chew electrical cables and water pipes which then introduces the risk of fire and flooding. It is not uncommon for rats to chew the electric cabling of vehicles which can result in expensive repair bills. Rats Cause Loss of Reputation: A rat infestation in or around a business (especially a food business) can lead to damaging publicity resulting in loss of customers or even the closure of a business. Social media feeds about pest issues in businesses intensifies the speed at which these stories are made public knowledge. There have been many court cases involving well know food retailers that have resulted in huge fines been imposed. Drainage faults: A large proportion of the internal rat jobs we attend are due to drainage faults. 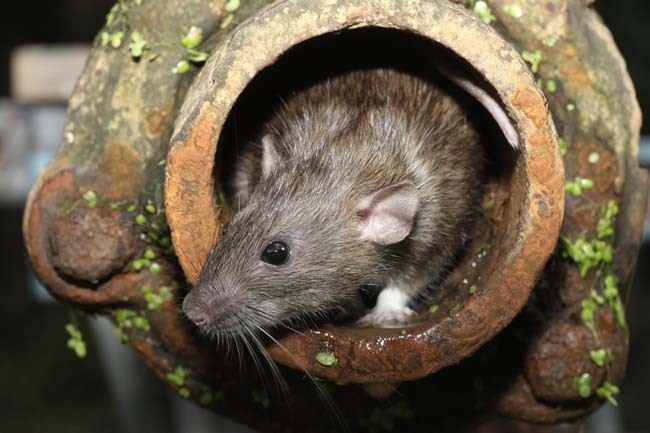 The sewers and drains provide an ideal environment for rats to live and the lack of investment and poor maintenance of the system, linked with the lack of a coordinated approach to rat control allows significant rat populations to develop. Rats will take advantage of any drainage defect to exit the sewers and gain access to our homes and businesses. We therefore always investigate the drainage system when we attend for rats. Gaps around pipes and cables: There are often gaps left where water pipes and cables pass through walls and rats will readily enter these gaps and gain access to both the interior and the cavity wall. Gaps in brickwork/stonework: Large gaps in the brickwork or weep holes will allow rats to access buildings. Gaps around doors and windows that have not been properly sealed will also allow rats to access the cavity walls. Especially common are gaps that have not been sealed under door thresholds. Rats will also readily chew through the plastic type air bricks that are commonly used on newer builds. Trees and Climbing plants: Plants such as ivy offer a climbing frame to rats that can then enter our roof spaces. Trees that overhang buildings will readily be used by rats to gain access to the roof space. Shrubs and vegetation that grow around the walls of buildings will offer harbourage sites to rats. Decking: The popularity of decking that surrounds houses offer ideal harbourage and nesting sites for rats. From here they can make feeding forays and even dig under the foundations of building, allowing rats to gain access to the inside. Live rat sightings: Seeing live rats running around the property will obviously confirm an active infestation. If young rats are seen, this could indicate that breeding has taken place and the infestation is established. Observing rats in several locations will tell us that the infestation is likely to be intense and extensive. Rat Droppings: Rats produce around 30 droppings a day but unlike mice they are usually concentrated in specific areas. The size of the droppings can tell us if there are both adults and young present. The texture of the droppings can reveal if they are fresh or old droppings. The colour of the droppings can indicate what the rats have been feeding on. Rat Noises: Often the first indications of a rat infestation are the scratching, scurrying or chewing noises that are heard, especially on a night. As rats are nocturnal in nature, it is usually the homeowner that is subject to sleepless nights caused by these noises emanating from the loft space. Rat Chewing Damage: As rats have constantly growing incisor teeth, they are constantly chewing things in their environment. On some items this can leave the indicative impressions of the incisor teeth. They will also enlarge gaps around pipes and cables that allow them to access to other areas and the size of this enlargement will determine that rats are the culprit. Rat Runs: Rats are creatures of habit and will use regular well trodden paths as they navigate around their environment. This results in the formation of rat runs which can be sometimes found on lawns, garden beds and even on the insulation of loft spaces. Rat Holes: When living outside, rats will excavate a burrow system. This offers rats protection from predators, areas to nest and places to store food. The entrance holes are around 10cm in diameter. Rat Footprints and Tail Swipes: In dusty locations such as factories, lofts, under kitchen units etc. rat footprints and tail swipes can often be found which, dependent of their condition, can indicate if the prints are fresh. Rat Smear Marks: When rats are regularly moving up, through and around objects, they will leave dark marks that are caused when grease and dirt on their bodies is rubbed off on the surfaces they contact. Rat Smell: An infestation of rats produces a distinctive stale odour caused by the build up of droppings and urine. This results in the need for thorough cleaning and disinfection after the infestation is eradicated. When we have carried out our initial survey of your property, we will then devise a control programme to eradicate the rats. This can involve the use of rat traps or rodenticides or both. Rats exhibit fear of new objects in their environment (neophobia) and will be very wary of control methods that are introduced. This behaviour needs to be considered when siting control methods, as poorly positioned baits/traps will not be successful. Rat Traps: Rat traps can be baited with an attractive bait that will entice the rat to investigate the trap. The trap needs to be set in a location where the rats are active and ideally at right angles to a wall. Some traps can be adjusted to various settings, so the slightest touch triggers the trap. These traps need to be checked on a regular schedule, so they can be emptied and reset. Rat Rodenticides: As a professional pest control company we have access to many types of rodenticides that will kill rats. 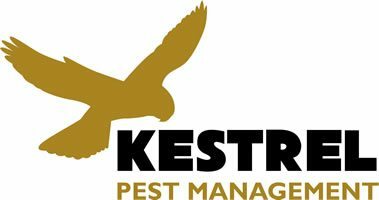 The rodenticides that we use are only available to professional pest controllers with relevant qualifications and as such are very palatable and effective against rats. These baits need siting in areas where the rats are active and ideally in areas where rats feel comfortable feeding. Safety Considerations: Before undertaking any treatment, we will carry out a risk assessment to ensure that any risks to people, animals and the environment are minimised. This can involve placing baits/traps in lockable bait stations, placing bait/traps inaccessible locations, using formulations of bait that cannot be spilled. Follow-up Schedule: It is essential that we revisit on a regular basis to ensure that any traps are emptied and reset, and bait points replenished. During these revisits it is essential to review the control programme so that the rat infestation is successfully eradicated. Appearance: The Norway rat adult (head and body) is 200mm to 270mm long and the tail is around 150mm to 210mm long. The colour of their fur ranges from brown to dark grey, which is lighter on the underside. An adult rat weighs around 250g to 500g. Life Cycle: Rats become sexually mature at around 3 months and after mating give birth to 6-10 young (pups) 23 days later. The pups are born blind, hairless and totally dependent on their mother. Rats exhibit post-partum oestrus which mean the females can become pregnant while they are still weaning. This allows a rat population to rapidly grow, and in ideal circumstances, a female can give birth every month. There are 2 species of rats present in the UK. These are the Norway rat (Rattus norvegicus) and the black rat (Rattus ratus). The Norway rat is by far the most common species we deal with as the black rat is mainly confined to isolated populations around port areas. Rats are excellent climbers and use their tails as a counterbalance when climbing along wires and cables. 1% of a rat’s DNA is dedicated to the detection of odours in their environment. This is why rats are so quick to detect and infest areas where food is stored, sold, processed or discarded. Rats also have a specialised organ used for detecting pheromones and is used as a means of communication between rats. This is called the vomeronasal organ. Rats exhibit neophobia, which is a fear of new objects in their environment. This means that traps and baits that are placed within the rat’s locality will initially be treated with caution. Therefore, it is essential to have professionals deal with rat infestations as they have the experience and knowledge to overcome this behaviour. Rats can fit through gaps as small as a marker pen’s diameter. If a rat can fit its head through a gap, then the rest of its body can follow. They also have ribs that flex on the backbone that allows them to fit through the smallest gaps. Have a problem with rats?